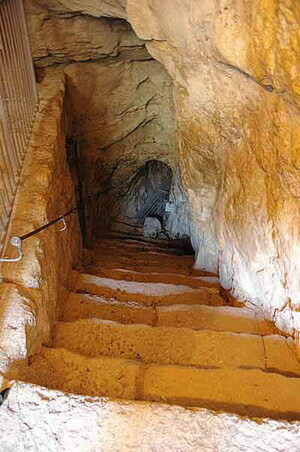 Hezekiah's Tunnel by Ferrell Jenkins at biblicalstudies.info and bibleworld.com. Photographs and content added for the Internet - July 23, 2007. Hezekiah was the king of Judah at a very critical period in the history of the nation (716/15 -687/86 B.C.). The Assyrians destroyed Samaria in 722 B.C. and then moved south into Judah. Sennacherib, in one of his prisms, claims to have taken 46 Judean cities. The most famous of these was Lachish. When Sennacherib returned to Nineveh, he had the walls of his palace decorated with the siege of Lachish. 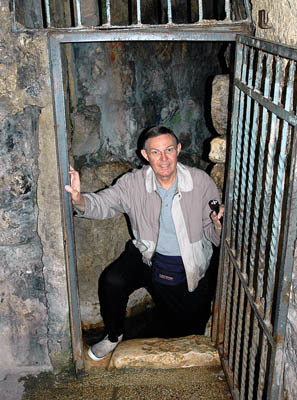 Entrance to Gihon Spring. Solomon was anointed as king of Israel at this spring (1 Kings 1:33, 38, 45). Hezekiah served Assyria for a while and then rebelled (2 Kings 18:7). He set about to strengthen the fortifications of Jerusalem (2 Chron 32:3-5). He had the fountains of water stopped so the king of Assyria could not find water. He also built a pool and dug a tunnel. "Now the rest of the acts of Hezekiah and all his might, and how he made the pool and the conduit, and brought water into the city, are they not written in the Book of the Chronicles of the Kings of Judah?" (2 Kings 20:20). Inside the tunnel. Unless one is claustrophobic, walking through the tunnel is rather easy. The floor is much smoother now than it was 10 or 20 years ago. 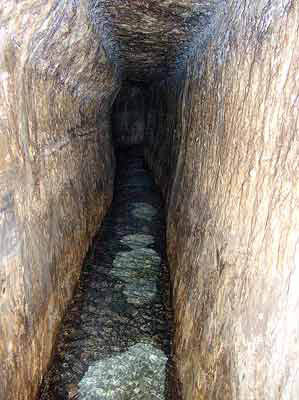 This tunnel was cut about 710 B.C. by Hezekiah, king of Judah, to bring water from Gihon spring to a new pool, later known as the pool of Siloam. 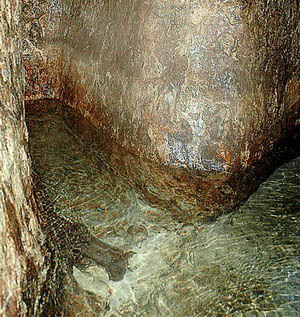 The water supply of ancient Jerusalem was the Gihon spring on the east side of the city where Solomon acceded to the throne of David (1 Kings 1:28-53). About 1800 B.C., the Canaanites who lived in Jerusalem built two towers at the Gihon spring, a Spring Tower and a Pool Tower. Recent excavations have brought these to light and they can now be visited. 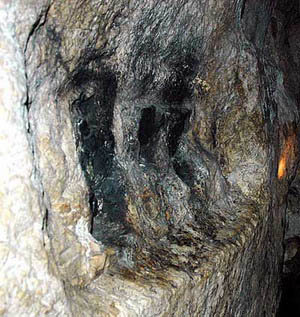 This is where the ancient inhabitants of Jerusalem got their water. 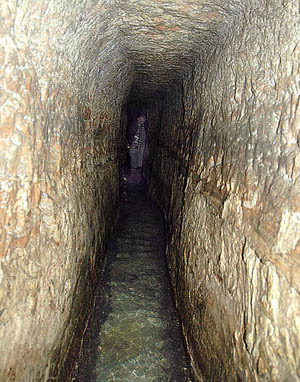 Hezekiah's tunnel brought water from Gihon spring on the east side of the city to a newly constructed pool on the west side. In New Testament times the pool was known as the pool of Siloam (John 9). The conduit or tunnel is a great engineering feat of antiquity. Edward Robinson measured it at 1750 feet long. The tunnel was cleaned and restored in 1909. The average height of the tunnel is slightly less than 6 feet, with a width of 23 to 26 inches. There is a total fall of 7 feet and 2 inches from the spring to the reservoir. Still inside the tunnel. My traveling companion, Leon Mauldin, can be seen in the distance. Digging the tunnel has been estimated as a 6 or 7 month job. The Siloam inscription was found in 1880 on the east wall about 20 feet inside the Siloam end of the tunnel. The inscription is about two and one half feet long, written in fine classical Hebrew. A. H. Sayce was the first to decipher it. It reads in part: "
The photo above shows where the inscription was cut from the side of the tunnel near the exit. The Inscription. 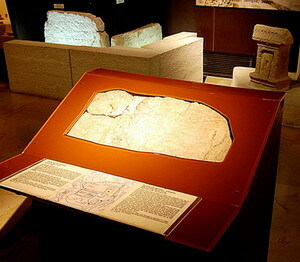 In the photo above we see the inscription in its case in the Istanbul Archaeological Museum. I have some closeup photos of the inscription but they are not sharp enough to be useful. This is due to the condition of the inscription and the fact that it is behind plastic. The photo this month [below] shows a false start made by the workers who dug from the south. They made a correction and continued until they met the workers coming from the Gihon spring. False start. Looking toward Gihon Spring, we see where the workers made a false start and then corrected to connect with the workers coming toward Siloam. At the Siloam exit. This is the exit at the Byzantine pool of Siloam. For a long time it was thought that this was the pool from the time of Jesus (John 9). The recent discovery of the pool from Roman times has helped to correct this. There has been some talk recently (July, 2007) about Israel asking Turkey to return the tunnel inscription. The countries seem to have a good relationship, and this may happen. Israel does not allow photographs to be made in the Israel Museum. In the Istanbul Archaeological Museum, this is not a problem. Nor is it at the British Museum, the Louvre, the New York Metropolitan, etc. Israel needs to move up a notch on this practice. Every teacher prefers to use his/her own photographs when possible. Photos © Ferrell Jenkins 2007. The photos may be used by others in teaching, but may not be used commercially or on web sites without permission. I do not sell photographs, and at the present time I do not have time to honor requests for high resolution copies of these photos. Thanks for your understanding.